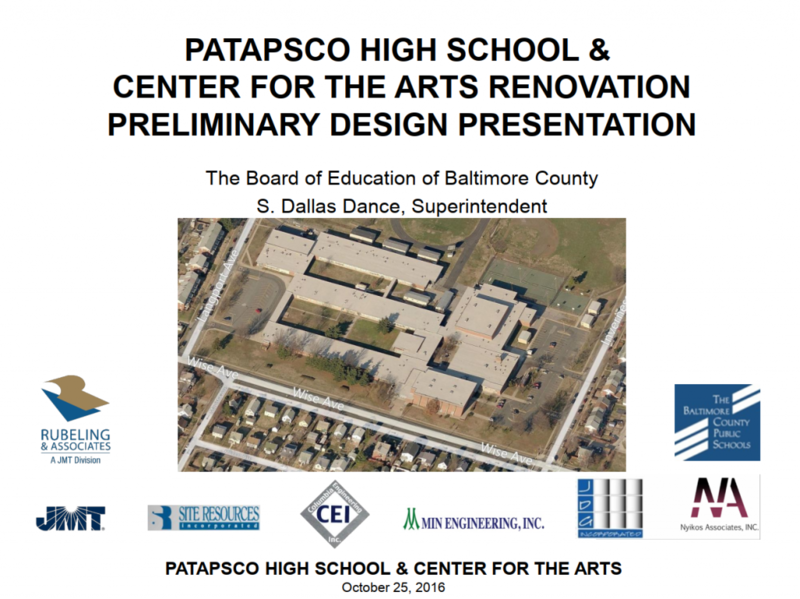 There is an old saying that goes, “Where there is smoke, there is fire.” While that was literally true at Patapsco HS, we found that there was also some “smoke and mirrors” style deception happening as well. In particular, the “powers that be” in Baltimore County are once again foregoing any transparency in providing actual facts as opposed to their particular “spin” on the situation. The Baltimore Post interviewed several students at the scene of the fire who stated that a neighbor living across the street contacted the fire department after seeing flames and thick black smoke. 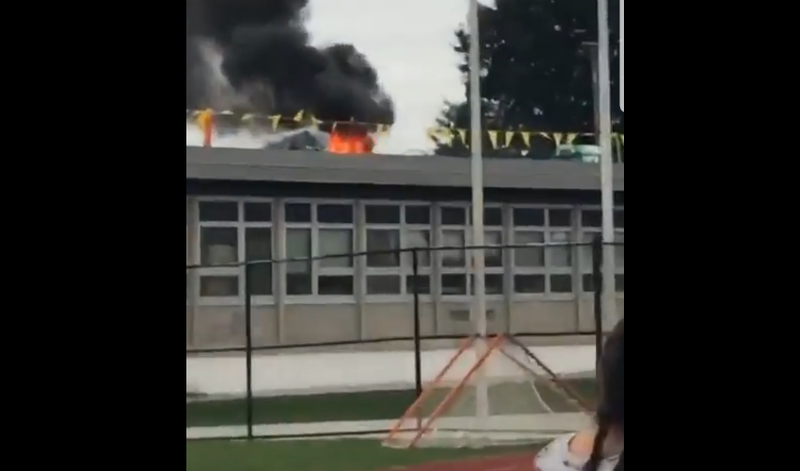 The students described being in class and hearing over a teacher’s walkie-talkie that there was fire on the roof of the building. Shortly thereafter, according to the students we interviewed, the fire alarm was sounded and the students began an evacuation of the building. We have some questions about what happened at the school. Based on the intensity of the fire, was there any possibility of the flames spreading to other parts of the roof due to the construction material? Also, who actually reported the fire? The 911 Center is your source for who reported the fire to 911. I spoke to Station 6. BCoFD’s understanding is at Patapsco staff member activated the fire alarm – but you should call the school to verify that. Contractors were working on a roof project, but the Fire Department cannot verify their exact whereabouts at the time the tar pot caught fire. That is a questions for the contractor. The Baltimore Post first contacted the 911 center and were told that the original call reporting the fire came from a cell phone. No other details were provided regarding either the cell phone number or the name of the person the reported the fire. Judging by the photographs and video from various news outlets, this fire seemed rather intense, especially since it started in a tar bucket. It was also reported that construction workers extinguished the fire. Another local news site showed a brief video of the ceiling inside one of the classrooms in which it was clearly visible that roofing tar had leaked into the interior of the ceiling. Looking at the above image, you may notice two names of importance: Rubeling & Associates and JMT. If Rubeling and Associates sounds familiar, it may be due to its indirect connection to the controversial Caves Valley Partners (CVP) development project known as Towson Gateway. That project that enraged community members after County Administrative Officer Fred Homan gave the nod for the county to pay for the removal of 30 trees from the “as is” property that was sold to CVP. Starting in 2013, CVP had plans to build a gas station on the 5-acre plot of land, which had housed Towson’s old fire station. But while incensed community members were focused on the corner of York Road and Bosley Avenue, the site of the former fire station, a brand new Towson fire station was built just down the road at Courtland Avenue and York Road. Rubeling was the architect of the new station, and also part of JMT (Johnson, Mirmiran and Thompson). If Mirmiran sounds familiar, it’s because it is the family name of CVP partner Arsh Mirmiran. Arsh is the son of Fred Mirmiran, partner and president of JMT. Not well known to the public, the Mirmirans had a stake in both of Towson’s firehouse projects. They also have a stake in several Baltimore County Public School projects, including Catonsville Elementary and Patapsco HS. Here is where the rabbit hole goes deeper. As reported by The Baltimore Post, CVP is a generous campaign contributor to Baltimore County’s political candidates and elected officials. At last check, we found that the Towson-based developer donated more than $140,000 to late County Executive Kevin Kamanetz, all seven current council members, and a slate campaign created by Kamenetz. And, to date, CVP has donated nearly $13,000 to Democratic candidate for County Executive, Johnny Olsewski, Jr. Here is another interesting article that appeared in the Baltimore Sun pertaining to Rubeling and Associates/RMT concerning Lansdowne HS. This particular link comes directly from Baltimore County Public Schools regarding Lansdowne HS. With all of that said, we believe that this matter deserves more attention than county officials providing “lip-service” concerning the safety of our school children. In addition, the principal at Patapsco HS has not followed up on our request for more information, despite the message contained in his Robocall. Below are some additional photographs and video of the scene. Hopefully, this may give our readers a better understanding of the facts, as opposed to the spin.